At a Public meeting, held on Tuesday, 31 August 1858, at the Mechanics Institute on Collins-street, it was agreed to form the Exploration Fund Raising Committee. The first meeting was held on Monday, 6 Sept 1858. By Monday 23 January 1860 the committee had raised sufficient funds and so at a Public Meeting of subscribers to the Exploration Fund held at the Mechanics Institute, Collins-street, the Fund Raising Committee was dissolved and most of its members were re-incorporated into the Royal Society of Victoria's 'Exploration Committee'. Stawell, Sir William Foster (1815 - 1889). President of the Royal Society, Chairman of the Exploration Committee and Chief Justice of Victoria. Born at Old Court, Mallow Parish, County Cork, Ireland in 1815, Stawell read law in Dublin and London before migrating to Australia in 1842. 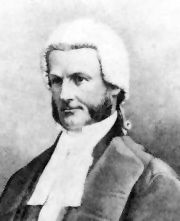 He became a Member of Parliament and a Judgeand in 1857, became Chief Justice of Victoria. He was president of The Philosophical Institute of Victoria from 1858-9, and chairman of the Exploration Committee. Burke bequeathed his watch and papers to Stawell, who was the chief mourner at Burke's funeral. He died in Naples in 1889 and was buried in the English Cemetery there. Wilkie, Dr David Elliott (1815 - 1885). Physician, leading member and treasurer of the Exploration Committee. Born in Edinburgh 1815, Wilkie studied in Edinburgh and Paris before sailing for Adelaide in 1838. He was disappointed at the state of the colony, so moved to Melbourne where he practiced medicine. In 1858 he became editor of the "Australian Medical Journal". Wilkie was prominent in founding the Melbourne Mechanics Institute in 1839, where he became treasurer. With Mueller and Macadam he formed a national collection of natural history specimens under the Philosophical Society of Victoria. He became a council member of the Philosophical Institute of Victoria and active member of the Exploration Committee. He died suddenly in Paris in 1885. Analytical chemist and medical practitioner and politician. Born in Glasgow, Macadam was appointed lecturer in chemistry and natural science at Scotch College, Melbourne. He arrived aboard the Admiral in 1855 and held the post for ten years. He became a member of the Philosophical Institute of Victoria in 1855 and was honorary secretary from 1855 to 1860. He was active in the move to obtain a royal charter, which the society achieved in 1860. 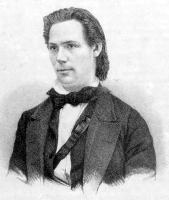 He served as vice-president in 1863. He was appointed Victorian Government analytical chemist in 1858 and health officer for the City of Melbourne in 1860. In 1862 he became lecturer in chemistry for the Medical School of the University of Melbourne. In ill-health in 1865, he sailed to New Zealand to give evidence in a murder trial. He fractured his ribs on the return voyage and complications set in. On his next trip to New Zealand in September 1865, for the postponed trial, he died at sea and his body was returned to Melbourne where it is buried in Melbourne General Cemetery. The macadamia nut was named after him by Mueller, (however, macadamized roads were named after a Scottish engineer). 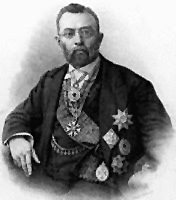 Mueller, Baron Ferdinand Jakob Heinrich von (1825 - 1896). Botanist and Director of the Victorian Botanic and Zoological Garden and influential member of the Exploration Committee. Born in Schleswig-Holstein, Germany, Mueller and his two sisters sailed to Adelaide in 1847 seeking a warmer climate due to ill-health. He worked as an assistant chemist before moving to Melbourne in 1852 when La Trobe appointed him the first Government Botanist of Victoria - a post he held for 43 years from 1853 until his death. From 1853-73 Mueller was Director of the Melbourne Botanic Gardens and in 1855-56 was naturalist to the North Australian Exploring Expedition under A C Gregory. He was instrumental in absorbing the Victorian Association for the Advancement of Science into the Philosophical Institute of Victoria and he was chairman of the Philosophical Institute in 1859 and a founder of the Royal Society of Victoria. He made an immense contribution to the study of botany, much of his work has still not been superseded. He died in South Yarra in 1896. McCoy, Sir Frederick (1817 - 1899). Professor, paleontologist, naturalist and museum curator. Born in Dublin, McCoy was worked at the Dublin Geological Society, mapping Ireland and cataloguing shells and organic remains. He then went on to work in Cambridge and Belfast, before being nominated as one of the first professors of Melbourne University, a position he held from 1854 to 1899. He was Director of the National Museum of Victoria from 1858 and vice-president of the Royal Society of Victoria in 1861 and 1870 and president in 1864. He died whilst at work, aged 73, on 13th May 1899 and is buried in Brighton Cemetery. Merchant and Mayor of Melbourne. Hodgson was born at Wadsworth, Yorkshire, in 1799 to William and Mary. He arived Port Phillip 1837-1838; became a merchant and speculated in land; in 1840 he took a squatting licence over Studley Park, on Kew's eastern bank of the Yarra River. He built house in Flinders Street and country quarters on the Yarra where he established a punt in 1839; insolvent 1841; grazing interests in Heidelberg district from 1842 and lived at Studley Park. First major of the Melbourne Volunteer Rifle Corps 1854. Foundation member of the Victorian Society of Fine Arts and patron of the Victorian Exhibition of Arts 1856. Mayor of Melbourne 1853-1854. He contested the Legislative Council seat of North Bourke iin 1852. He was elected to the Legislative Council for the seat of Melbourne, August 1853	March 1856 and the seat of Central,	November 1856	August 1860. He died 2 August 1860 at Studley Park. Journalist. Born at Loose, near Maidstone, Kent. He trained to enter the church but took up journalism and at 20 was the editor of the Hertfordshire Mercury and Country Press. He published a book in London in 1845 which brought him into correspondance with William Howitt and other writers of the time. In 1854 he migrated to Melbourne and became a leader-writer at The Age. He became the editor of the weekly Melbourne Leader in 2856 and also joined the staff of the Argus as leader-writer, dramatic, art and literary critic. In 1859 he became editor of the Melbourne Punch. He left journalism in 1863 and became the Victorian parliamentary librarian. In 1869 he started the Touchstone, then became editor of the Argus' weekly paper, The Australasian. As a member of the Royal Society of Victoria, it was hoped he would write an official history of the Victorian Exploring Expedition, but unfortunately this was a work he never attempted. In 1871 he founded the Victorian Review and edited the Melbourne Evening Mail. He retired in 1898, but continued to write for the The Age untill his death in 1910. He was widely read and had a retentive memory. He was one of Melbourne's best lecturers, he espoused free-trade and was an advocate of cultural and intellectual elevation and helped to establish the Garrick Club, the Melbourne Shakespeare Society, the Alliance Francais and the Dante Society. He married Annie Fieldwick and had two sons before she died in 1849. He had two more sons and four duaghters with his second wife, Eliza Julai Kelly of Melbourne. Smith died of cystitis at his Hawthorn home, Amwell, on 19th March 1910 and was buried at Boroondara Cemetery. Pike, D. et al., 1966. Australian dictionary of biography Melbourne: Melbourne University Printers.